Knittel Hammer Crushers involve the use of impact rather than pressure to crush material. 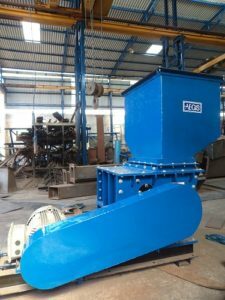 Single Rotor – Hammer Crushers are used for crushing run-of-mine coal, stone, ore, cullet and other difficult materials. They reduce large-lump materials to 6 to 8 mm size in one operation. These can be furnished with or without a metal trap for the removal of tramp iron or un-crushable lumps. AEGIS manufactures Knittel Hammer Crushers in 6 models. Right model can be chosen depending on the application and requirement.